When you first see this pose, you might think, 'uh no WAY, Sandra!' However, there are many modifications as you will see, and thus, it may be more accessible than you think! In Yang style yoga, this pose is known as Hero or Thunderbolt pose, aka Supta Virasana, sitting on the heels, or Supta Vajrasana, sitting between the heels, respectively. Yin uses different names to indicate that we approach the poses differently, easing into them, and holding them for several minutes as opposed to several breaths. Let's get started. I did these poses in regular clothes to show you you do not have to get into yoga clothing! Watch a group of young children, and you will invariably see several of them plop down into this pose effortlessly. What happened to our flexible hips? Life. Stress. Not living on the floor. Sitting on chairs. We sit a LOT in a chair at our sewing machines, more so if you have your pressing centre set up so that you just swivel your chair or your body over to it and then go back to sewing. Consider moving your pressing centre across the room so that you do have to get up, walk a few steps over to it, which is so good for your body, period. If sitting like me there makes you think, 'ain't gonna happen, Sandra' then here are some variations. First, check in with your knees and ankles, as this puts a lovely stress on your ankles, but it can be too much for some people. Remember, I have said that the feet are the first place where we start to tighten up, so anytime we can stress our feet, we are helping to offset, or prolong the aging process. You may find that simply sitting back on your feet as you see above, is plenty for now. You can sit on the floor, or you can place a rolled up towel or small quilt beneath your ankles if it is too much for them just now. If that is simple for you, try the next stage, sitting between your feet. 1. Try rolling up a quilt and placing it behind your knees, and on your calves. Rest back on it. This reduces pressure on the knees. 2. 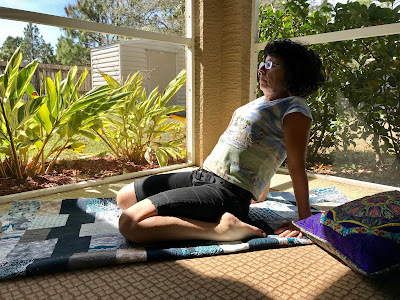 Alternatively, if the pressure is too great using a rolled up quilt, try sitting on a block, or if you don't have one, as I don't here in Florida, how about a few quilt books or fat novels?! This will lessen the pressure on your knees and hips. Work on removing one book at a time over the course of several weeks or months. 3. 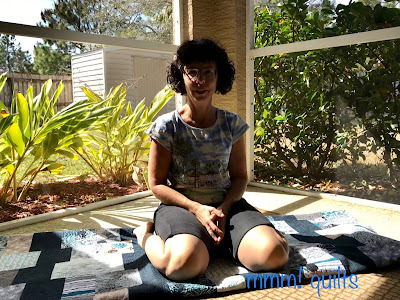 If the knee is not coming to the floor, then be sure to rest it on something, either another block or another rolled up quilt (so many uses for our quilts!) or a cushion so that you can relax your quads. 4. All right so you've got yourself into your variation of the pose, a variation that gives you some tugs, or 'comfortable discomfort', to quote Bernie Clark. Stay here for 3-5 minutes, or, if you want to approach the full pose, then place your hands behind your feet and start to lean back, arching your lower back (great extension for the low back!) and maybe letting your head drop back, as long as you have no neck problems; if you do, then keep your head facing forward. To safely drop the head back, first tuck in the chin to lengthen the back of the neck, and then slowly allow the head to drop back. 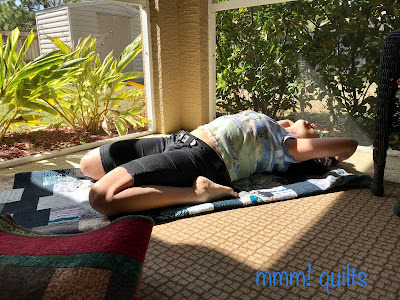 This is great for the cervical spine, and stimulates the thyroid gland, as well as gives a lovely stretch to the ligaments in the front of our neck, which tend to be shortened with aging, (think stooping) and with heads bent over our sewing, and also with heads bent over our devices, (iPads, phones, laptops, etc). Keep the chest lifted, and arch your back. Again, set your timer and stay in the pose, breathing steadily and slowly to a count of 3 or 4 on each inhale and exhale, for 3-5 minutes. 5. If you are feeling super-comfortable, and you are not needing the modifications above, feel free to lean back as in #4, easing your way down to the floor. The rule is that if the knees start to lift off your mat, stay there; don't go any further back. This tugs into the quads quite intensely but deliciously. It also is quite a strong backbend in the arch of the back. You can even raise your arms over your head which gives a nice stretch for the upper chest, something really nice for us quilters! Full pose; note my arms and elbows don't rest on the floor because of tight shoulders and a couple of whiplash injuries. They will get there one day, as I like to say when I teach, maybe this lifetime or the next; it just takes time. 6. Another modification is that you may like to ease back onto a bolster, a cushion, rolled up pillow, or rolled up quilt. You can place it in two ways, first, lengthwise under your spine. Keep the arch in your low back. It won't be as intense as with no support, but it should still be there. This feels quite wonderful. Or place the rolled up quilt perpendicular to your spine, under your shoulder blades, and let your head go back to the floor. This is LOVELY for opening the upper chest, and pulls nicely across the pectoral muscles too. I particularly love the pose like this. 7. Now, if it is one knee that won't allow you to do this pose, you can do the Half Saddle, where you do any of the modifications above or not, but keep one leg straight. 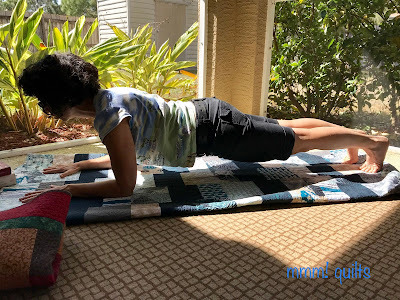 It is probably best to sit up on a cushion or rolled up quilt if you are doing this variation. Be sure to do both sides. You can sit up, as I am doing, or lie fully back, depending on what I said above regarding modifications. Remember, "If you're feeling it you're doing it," and, "You want to feel sensation, but don't make it sensational." Wise words from Bernie. Stay in the pose as I've said for 3 -5 or more minutes. How the heck do you come out? "Call 911" or "Rent a crane or a forklift" are options that Bernie gives, LOL. The second option, if you are lying fully back, is to roll very slowly to the side, coming off the rolled up quilt if you had it under your spine, straightening out your legs if they were bent, and making a pillow for your head by bending your arm and resting your head on it. Be still for a minute or so. 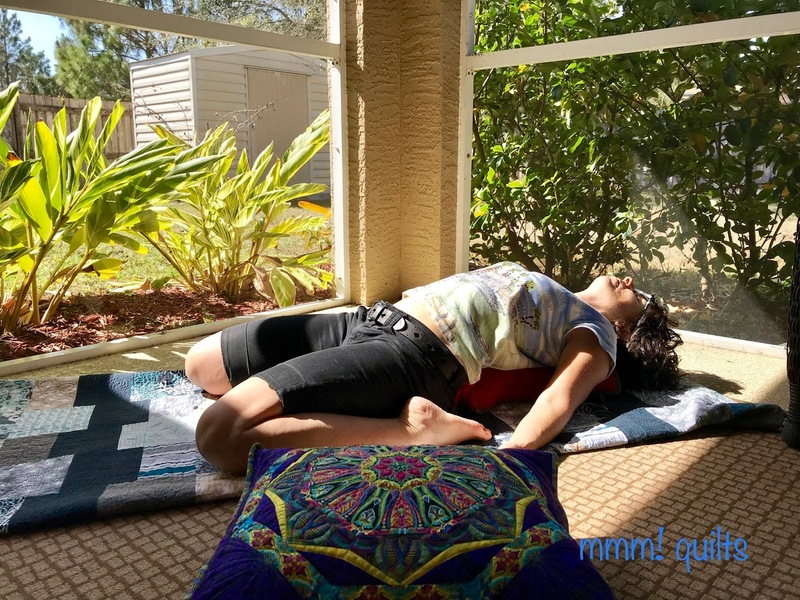 You can then lie onto your back and either hug the knees into the chest, keeping your back flat on the floor now, or you may want to do a few leg raises, legs bent or straight, as a Yang pose to further release. Be sure to place your hands under your bum, palms down to protect your back and keep it flat. A third option is to come out the way you went in. It is very important to protect your back, so tighten your abs, using your core. In other words, pull in with your tummy and pull up on the pelvic floor at the same time. Push into your forearms and elbows, leaving your head back as you slowly come up, head coming forward last. Keep going forward, coming onto your hands and knees, resting quietly on all fours, observing the sensations of warmth, coolness, tingling, buzzing, 'a spearmint feeling,' as one of my students has coined the sensation of coming out of these long held poses. Next, stretch out your legs coming into Crocodile or plank pose which helps to release the knees, and is a good Yang pose to do, holding for maybe 30 seconds, pulling your tummy in. Then lie down on your tummy for a minute until you feel ready to either go into another pose or get back up (slowly) and into your sewing chair! Bernie Clark gives a lot of information and a couple of demos on this pose here. If your blog is more than 2 months but less than 3 years old, please consider joining this most worthwhile event, which will run over April and May, 2 weeks in each month. Lots of discussion happens, as well as learning, and many friendships made. You can find the original post with more information here. 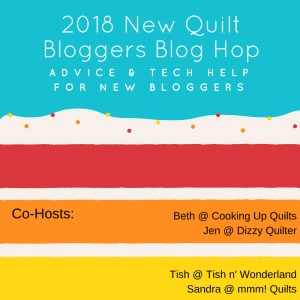 The #30quiltdesignschallenge2018 is on! Click on that hashtag and you will be taken to a 'pool' of original designs that the challengers are submitting. It works out to making about 3 designs per week. I did it in my Quiltography app, a terrific, reasonably priced app for iPad that is pretty user-friendly if you take a little time to play with it. You can even take a photo of fabric and input it into the library to use in colouring in your quilts. Here you see a couple photos of 'Paradiso' fabric along with fabrics already in the Quiltography library. For all the details on this challenge, click here, or click the button in the sidebar. I am not an affiliate of Quiltography, just so you know! Okay that's it for me; I am going to take a couple of days off the blog with any luck, and hunker down and sew beginning right now. The only part of the Super Bowl I'll be watching is maybe the odd fabulous play, or running out to see some great commercials. Oh, how I wish I had a yoga studio nearby! I would love to do yoga, but I have some back issues and I'm nervous about trying it without someone there to correct my form. The last thing I need is to do damage when trying to make myself better! But this makes it look so appealing! I may have to chat with my physiotherapist and see what she recommends. Hmmm. There was a time in my life when I could sit between my feet but it was a long, long time ago. Yes, that is one challenging pose. I need to read this a few times and try it once I get back into practice- Tuesday! I would still like to get in to yoga, I think it would be a nice partner with my running. I've only tried a couple of times. The first time I don't think the instructor was a good fit for me and the second time was wonderful, but the place closed down that was offering the class. I wonder if You Tube offers good instruction? THANK YOU!!!!!!!!!!! My feet always cramp in child's pose...why didn't I think of the books!